On February 3, 2018 A.R.D. held its annual meeting, hosted by Professor Alberto Albanese at the “Istituto Ospedaliero Humanitas” in Rozzano near Milan. Usually our annual meeting is divided into two parts. During the first part in the morning some speakers illustrate some different aspects of dystonia. After the lunch break the General assembly for members is held. The title of this year’s meeting was “Dystonia beyond a motor disorder” as we wanted to focus on some alternative therapies and different strategies of how to manage the disease. The stimulation is given by a small plastic cap on the head, which leads a light electric current to the cerebral cortex and may reduce the excessive excitability connected to dystonia. As this study is still in progress, Dr.Cocco asked for some volunteer participants. Dr. Anna Castagna from “Istituto Don Gnocchi”in Milan, spoke about “A multidisciplinary care for dystonia patients”. This approach is used in her hospital, where a team composed by neurologists, physiotherapists, psychologists, orthopedists and speech therapists take care of the dystonia patient using therapies like motor learning, stretching, biofeedback techniques, relaxation training, and cognitive behavioral therapies. It is the so called “SPRINT approach -“Sensorimotor/Perceptive/Rehabilitation/ INTegrated”. Dr. Anna Castagna and Yannick Grosskreutz. Dr.Wolfgang Ulrich, a psychologist working in her team illustrated a “Mind-body therapy to stimulate new learning for dystonia patients” starting from your own body as a source of self- esteem. 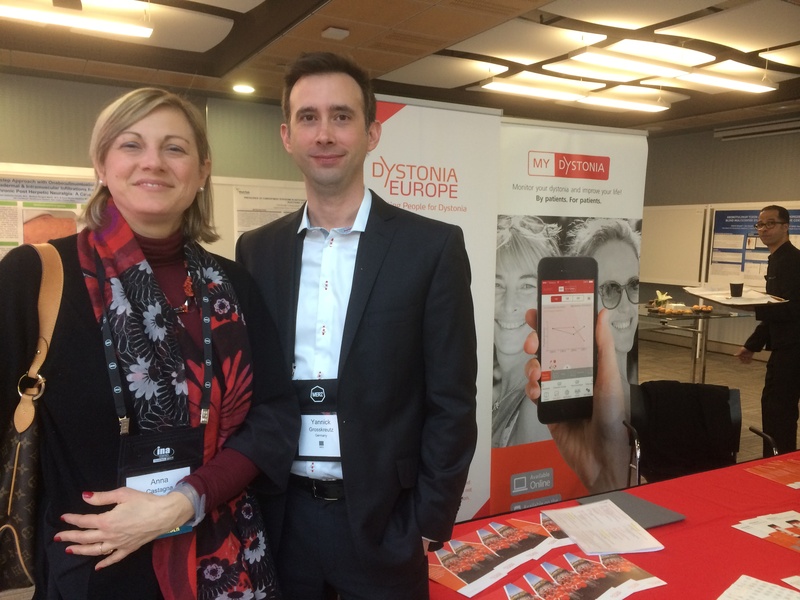 Barbara Meda from Merz illustrated the app MyDystonia, which was created 3 years ago. Unfortunately the APP does at present not have as many users in Italy as in other countries. She illustrated the app, showing how easy it is to use the digital diary on a daily or weekly basis. You capture physical symptoms, exercise, pain etc and before you see your treating neurologist you can create a report which demonstrates your well-being over time. There were two young neurologists who presented their studies. One was by Dr.Giovanni Flamma from “Civil Hospital of Senigallia”, Ancona. With his “Neuropsychiatric dimension of focal dystonia: a qualitative analysis” he won the 2017 A.R.D. Award for “Best study about dystonia by young doctors”. His study analysed the psychic symptoms of 63 dystonia patients, examining how much their quality of life is affected by the disease. One finding is that botulinum toxin injections improve quality of life but do not reduce anxiety and depressive disorders. Dr.Chiara Scaratti from “Istituto Carlo Besta” in Milan presented her “Experiences of life – DBS Stories”. This is a specific project about DBS in young people with dystonia. It is a pilot study with a small number of patients followed by “Besta Neurological Institute”, looking at the quality of life and the body experience of patients who underwent Deep Brain Stimulation when very young. Now they are teenagers or adults and the study examines the impact DBS has had and has on them. There are very few studies on children with dystonia. The last two speakers were dystonia patients who have faced and now manage their disease using alternative therapies as well. The journalist Paola Emilia Cicerone was diagnosed with blepharospasm but did not want botulinum toxin injections. Instead she used acupuncture, psychotherapy and mindfulness meditation. At present she has no longer any symptoms, and she does not know whether she has totally recovered or not. She wrote a book “Clandestine blindness” where she describes her experiences. ARD member Maria Gabriella Manfredini had serious dystonia symptoms in her arm and could not use it any longer. She went to “Istituto Don Gnocchi” in Milan where she had some botulinum toxin injections. She began to practise Tai Chi, the Chinese martial art and gymnastics, which is also an active way of meditation. She felt she could improve her body control and now, after three years, she has totally recovered. She came to our meeting with her Tai Chi teacher (who is black belt 2° Chieh) and both performed some Tai Chi exercises for ten minutes in front of us, with harmonious movements and very high control of the whole body, which is a great success for somebody with dystonia. Mrs.Manfredini said that Tai Chi allowed her to restore muscle tone, agility, breath control and balance. Around 80 persons took part in the meeting, most of them were A.R.D. members coming mainly from Northern Italy. Some were new members who had never participated to such an event. They were all very glad to be able to attend a meeting, where all the focus was on dystonia. During a whole day they could learn and better understand the disease as well as meeting others in the same situation.